Bryan Lohr is a native of Stoystown, PA and one of America’s most distinguished young organists. Bryan’s early studies on the instrument began in Somerset, PA with Randy Fagan and continued at Shadyside Presbyterian Church in Pittsburgh with Jason Kissel and John Walker. Bryan holds a bachelor of music degree from the Juilliard School where he studied with John Weaver and Paul Jacobs, and a master of music degree from Carnegie Mellon University where he studied with Donald Wilkins. Bryan is also the first organist to have received the prestigious Artist Diploma from Carnegie Mellon. 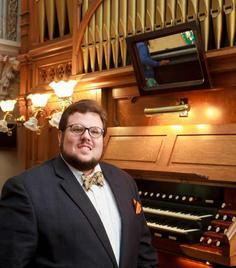 In September of 2016, Bryan was appointed Director of Music Ministries at First Presbyterian Church in Cumberland, Maryland, where he leads a dynamic music program, playing weekly one of the finest organs in western Maryland. As a performer, Bryan travels frequently across the United States and has appeared in venues sponsored by the American Guild of Organists, the Central Pennsylvania Festival of the Arts, and some of America’s most prominent organ recital series. He has also appeared as an organist with the Johnstown Symphony Orchestra, the Chamber Orchestra of the Alleghenies, and The Bach Choir of Pittsburgh. Bryan teaches privately on both organ and piano, and has served as a member of the pre-college music faculty at Carnegie Mellon University. As a collaborative artist, Bryan is one of the most sought-after accompanists in western Pennsylvania, serving as the choral accompanist for the North Star School District, the Inclined To Sing Children’s Chorus, and Rodoljub, the oldest Croatian vocal ensemble in America, based in Johnstown, PA.
Bryan and his wife Catherine, a high school life skills teacher, reside along the banks of the Stonycreek River in Hooversville, PA with their miniature dachshunds Baxter, Patches and Rory, as well as Bryan's newly rescued puppy, a border collie/St. Bernard mix named the Abbess Hildegard von Bingen, or Hilde for short. Aside from music and family, Bryan is active in numerous civic and charitable organizations throughout western Pennsylvania. He is a past member of the Hooversville Borough Council and two-time past-president of the Hooversville Lions Club. Bryan currently serves on the board of directors for St. Paul’s Homes in Greenville, PA and is an executive officer of The Ethel Fund, Inc., a charity assisting family pets with catastrophic veterinary needs. Bryan is also the head coach of the Varsity Forensics Team at North Star High School in Boswell, PA.